Does your Church Have Benchmarks for Christian Education? The word benchmark is now used in many fields from topography to investing to education. Essentially a benchmark is a consistent reference point against which something can be measured. When it comes to knowledge and experience of the Christian faith, benchmarks can be very helpful. For example, what can one expect a 12-year-old to know about the Bible? What about a 6-year-old? A 30-year-old? Some denominations and churches have mapped out answers to these questions, breaking it down by age group. Of course, there are plenty of caveats to offer: people grow in faith at different rates and furthermore, church is not be about ‘passing’ standards, to name a few. However, it is important for churches to write out what they hope children and adults will learn and experience as they progress in the Christian journey. For example, a church can hope that at an early age children will know that they are created and loved by God and at subsequent ages children will be able to recite the Lord’s Prayer, look up verses in the Bible, and participate in worship or liturgy. Setting down these hopes and expectations provides a helpful map, encouraging both teaching and learning in a congregation. Does your Church or Denomination have Benchmarks or Standards? As we begin another program year, it is worth asking whether your Christian formation program is guided by a ‘standards document.’ Such a document could be created at a local, regional, or national level. Note that this is not the same as a curriculum. Rather, a good curriculum is the method through which a church meets its standards/benchmarks. When the benchmarks come first, they inform the selection of a curriculum. While no one curriculum can meet all the needs of a church or denomination, having benchmarks can help educators and clergy see the areas that a curriculum does not cover (service ministry, for example). Below are four documents that serve as examples of how a church, region, or denomination can create a document to map out Christian formation goals. Perhaps your region or denomination already has a document like this. 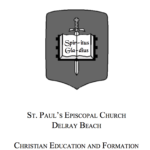 This Episcopal church in Florida created their standards document in the mid 2000’s. Notice that it includes children, youth, and adult benchmarks. This is most recent document of the examples, as it was published in 2015. The emphasis here is on children and the Christian messages that they can be exposed to at each age/stage. The tables are nicely broken down in categories such as: Worship; The Bible; Home & Family; Methodist Heritage; etc. This document is the longest of the samples we have provided here. It some ways, the document is almost a curriculum map. 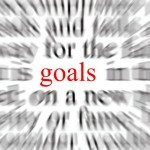 Notice the emphasis on goals for each age group. This short post on Building Faith from 2012 briefly maps out Christian learning goals for ages pre-school to middle school. This post is not a formal document, but it is grounded in Sharon’s long experience as a formation expert. If you decide to create a document for your church, it doesn’t have to be 10-20 pages long. But you also should’t take on the project alone. Here are some tips from our team at the Center for the Ministry of Teaching. 1. Don’t do it alone: Contact your diocese, synod, region, judicatory or denomination. Or get in touch with other churches who have already created a benchmarks document. 2. Go slow; break it up: For example, start by simply asking yourself, “What do I want [this age group] to know?” Then, in time, tackle another age group. It will get easier each time, and you can complete your document gradually, perhaps over the course of a year. 3. Don’t start from scratch: Begin your work by looking at a sample, such as the ones shown above. There is no need to reinvent the wheel! And again, consult your diocese, synod, region, judicatory or denomination to see if standards already exist. 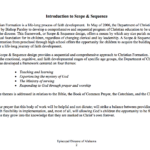 In the Episcopal tradition, you may also consult the following documents for context: The Children’s Charter and The Charter for Lifelong Christian Formation. 4. Work collaboratively: Seek out selected input from people in your faith community: clergy, staff, volunteers, teachers, parents, and parishioners. 5. Use a trusted curriculum for signposts: You should not let a single curriculum guide your Christian education standards, otherwise you’ll simply write your goals based on that curriculum. However, you can use a curriculum to reference, for example, a list of Bible stories or seasonal topics to cover. 6. Tap folks who understand human development and learning: You probably have teachers or other people in your community who have studied human development. They can help inform or tweak age-specific standards to make sure they are realistic and appropriate. 7. Limit collaboration in the final draft: The final document should be written and edited by one or two people. This ensures consistency in tone and format. 8. Get your head pastor on board early: The leader of your faith community can champion a benchmarks effort, help get the message out, and support the final document. On the other hand, the leader can ignore the process and/or undercut the final document. Ensure the former scenario by getting your head pastor/minister/priest on board early.